A simple and effective heating solution for all types of drums; particularly plastic containers. 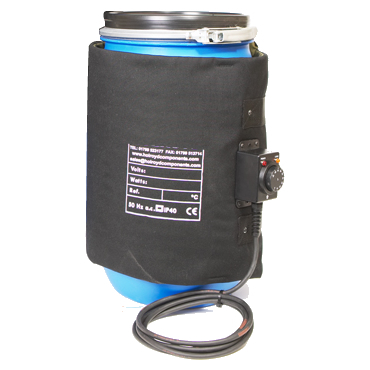 This particular heating jacket is suitable for a standard 50 litre capacity drum/ container. These jackets are ideally suited for the warming of a variety of products including fats, oils and foodstuffs. Used throughout the world by a multitude of industries from pharmaceutical to chemical, cosmetic to food, the heater jacket is the ideal solution for heating liquid materials stored in metal or plastic drums. The jackets incorporate a polyurethane coated nylon outer jacket fitted with adjustable retaining straps and quick release polyethylene clips. A high efficiency layer of insulation is held in place between the outer cover and the inner element carrier. The silicone insulated heating element is woven back and forth along the length of the carrier. The braided supply cable is retained by a polycarbonate gland and insulating plate. The heating jacket (50l) is manufactured from lightweight but resilient materials and fitted with adjustable quick release buckles for ease of installation and removal. Temperature is regulated via a built-in thermostat up to a maximum of 90°C for plastic drums. Jackets with higher power ratings and 0-120°C thermostat can be manufactured for use with metal drums. LMK Thermosafe has been designing & manufacturing specialist drum heating equipment for over 25 years. This video demonstrates how simple it is to use one of their standard flexible heating jackets for your drum heating application. Simply unravel the heating jacket & wrap it around the drum. Clip the sturdy buckles together & tighten the straps. Set the dial of the themostat to the required temperature & connect the 5m cable to the power. The jacket will quickly warm up & starts transfering the heat to your drum within seconds. The high-grade insulation within all heating jackets is designed to make sure as much heat as possible is going into your application - rather than heating the room. This feature also protects the worker: You will notice that the outside of the jacket feels warm to the touch, but will always remain a safe temperature. The integral thermostat will constantly control the heating jacket - so it can be left on indefinitely until you need to remove it. Make sure the power is disconnected from the heating jacket before simply squeezing the buckles open & removing the unit. The jacket can be folded neatly & stored safely until the next time you need it. Flexible heating jackets from LMK Thermosafe are easy, convenient & efficient. Contact unitemp Africa for heating jackets in various standard sizes - from 25l drums to 1000l IBC tanks. We also offer ATEX & IECEx certified drum & IBC heaters for potentially explosive atmospheres. Nylon base fabric. Hydrlysis resistant, polyurethane coated polyamide substrate with fluorocarbon finish.